I just posted my fourth video. This one is about the writing process and the degree to which it is so individual that no one can specify how it’s supposed to work. On review, I realize that I sound a bit angry in the video. Be assured that I’m not pissed off at all–this is just how I sound when I get very passionate about something. I’m a very passionate person, especially about ideas, and I can get very “enthusiastic” when speaking about them. Future videos will be calmer–I think that this level of intensity may be offputting, but I don’t feel like reshooting because I like what I said and, as I do these things without a script to keep them informal, I’m not sure I would get all the same stuff in. Anyway, I’m really not angry here. It’s just how I get sometimes. 1. I never, ever, ever outline anything. Ever. Shame on me. Part of the reason for that is that, as an old high school debater and debate teacher, I tend to think in outlines anyway. When I sit down to talk to my 17 year old daughter about something I think she needs to do better at home (a rather rare event, I have to say–she doesn’t need a lot of correcting) a careful listener could discern a major point, subpoint, sub-subpoint, sub-subpoint, new subpoint, new subpoint, new major point kind of structure. If I write something, it is going to be well organized simply by virtue of MY having written it. Another reason is that if I start writing the outline, I’ll get caught up in making it the most perfect, the most detailed, the most deeply sub-pointed outline in the history of the human race. The outline becomes an end in itself rather than a tool for developing the story. The most important reason, though, is that that’s just not how my creative process works. I literally just start writing. I sort of have a broad idea in my mind where the story is going, but the story often has a way of going somewhere else. My rough idea of the structure for the book that became To Honor You Call Us contained nothing about Max Robichaux’s struggles with his own traumas and not the first idea about the Vaaach or the Pfelung. 2. I constantly put my characters in peril without knowing how they are going to get out. I start with the Cumberland outnumbered and outgunned and then unleash my “inner Max” to see how Captain Max Robichaux gets himself and his ship out of the jam I put them in. That’s one of the most fun parts about this job. 3. 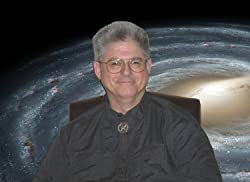 I give my readers lots of complexity–detailed complex battle tactics, thorough explanations of weapons systems, technical details about sensors and countermeasures and stealth and lots of other nuts and bolts so that the reader can understand and visualize what’s going on. Lots of times, I tell the reader in detail what a given control or display looks like down to the shape of a knob or the color of an indicator light. Experts say you’re not supposed to do that. I noticed that this kind of detail was the hallmark of such failed writers as Patrick O’Brian and Tom Clancy, so I decided to emulate them and see if I can fall on my face in similar fashion. Readers seem to like the detail–they say it makes everything real to them and brings them in to the story. 4. I show my readers the decision-making process. The officers on the Cumberland talk, not just about what they are doing, but about why they are doing it. They debate the larger moral choices and discuss pros and cons of tactical maneuvers. Experts say “just do it,” but if I want the reader to understand why a particular tactic is so brilliant, they need to see the alternatives and why they might be appealing but ultimately aren’t going to work. Basically, I respect the reader’s intelligence and invite him or her to sit down at the Wardroom table with my officers and participate in their thought process or sit at the Commodore’s Station in the Combat Information Center and be a part of the tactical choices that save the ship or, even, save the Union. I want my readers to feel like they’ve joined the Union Space Navy, not like they’re looking at their iPads watching a movie about it. 5. I have lots of back story. LOTS of back story. Everything and everyone has a back story in my mind. The experts say to skip the back story–you don’t need to create all that stuff. If the reader doesn’t see it, don’t waste time on it. That’s not the way I operate. Not at all. You may never see much of it on the page, but it’s there. If someone pulls out a weapon, there is a reason in my mind for how that weapon got there: what year it was introduced (hint: in a personal weapon it’s the model number), what it’s made of, what it looks like, what kind of cartridge it fires, what weapon it replaced and why, its strengths and weaknesses, and what effect it has when used. In most cases, I will have fired (and maybe even own) a weapon of similar design, generally using the same cartridge. CIC is where it is and designed the way it is for a reason, and evolved from other control arrangements in a known way over the years. 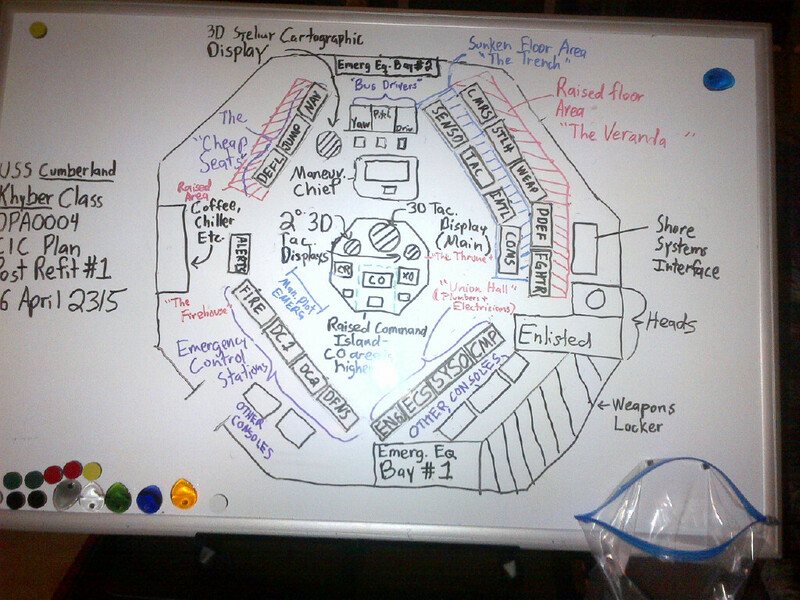 I have a diagram (ugly–hand drawn on a white board) of the layout of CIC: where all the stations are relative to one another. In fact, I think I’ll put it up with this post. I make it real to myself so I can make it real to you. Yep, I’m putting in the diagram. I may post about the CIC arrangement later–there is some interesting stuff to say about it. Interesting to me, at least.